Wow! The iDonatedIt App will allow people to keep track of non-cash donations to charities like clothes and furniture. You can track this donations, and they can be used as a taxable deduction. This is so cool for especially since I can use this at clothing swaps. iDonatedIt App retails for $2.99 at the iTunes app store a version for the Droid is currently in the works as well. In more non-iPad, Apple-related news, we learned earlier this week about iDonatedIt, an iPhone app developed by BMG CPAs in Lincoln, Nebraska. The app is designed to track all non-cash charitable contributions whether it be clothes, furniture or family members (okay maybe not the last one). This will allow you to track all of our donations to Goodwill, Salvation Army, etc. rather than receiving that crappy receipt they give you that has nothing on it. The problem with Obama’s plan for small business is that the definition is wrong. Most businesses are small businesses according to the Small Business Administration. The term “microbusiness” has yet to catch on, but the truth is that there are a lot of self employed sole proprietors who need help keeping their businesses afloat. From Chris Rabb’s article on the Huffington Post. Most people don’t realize this, but 99% of American businesses are “small businesses”. That is, only one in 100 business employs 500 or more workers, which is how the Small Business Administration (SBA) generally defines this term so often bandied about by politicians on both sides of the political spectrum. So, it’s reasonable to ask ourselves: If 99 of every 100 firms in America are small, what value does the term “small business” really have? Not much, actually. The reality is, the value of the term of art “small business” is only political in nature; “smallness” suggests local, Mom-n-Pop, salt-of-the-earth, when in fact the one million small businesses President Obama proposed to help out in his address through a $30 billion investment of tax-payer money are not really representative of most small or new ventures. In fact, three out of every four businesses have no employees at all! 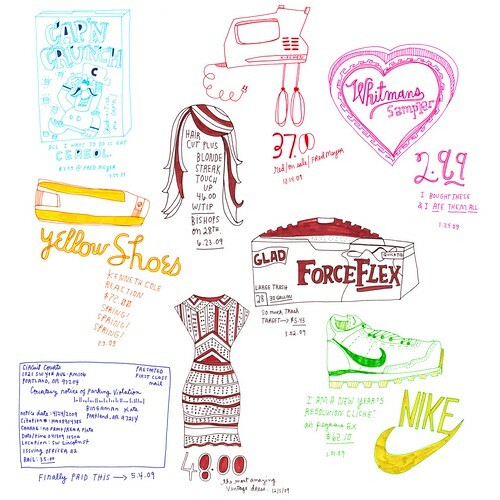 For a few years, Kate Bingaman-Burt has been drawing pictures of everything she buys. Last year, Alex Ressi launched Tweet What You Spend and now there’s Bundle. Bundle lets you share news of what you bought with other people online. It keeps being compared to Mint which is an erroneous comparison. It is kinda like comparing Vampire Weekend to The Talking Heads, but that’s a long music snob discussion that is not for Keeping Nickels. Bundle is about social shopping. Mint is about managing your money. If you want compare Bundle to anything, I suggest calling it “Foursquare for your wallet”. Update: There’s also Blippy which is like Bundle. My friend mentioned it last week, and today I read a good post from Outright detailing how your donations to the Haiti relief effort can be tax deductible for your 2009 return. Federal law requires that you keep a record of any donations you make. To be deductible, contributions must be made to qualified charities. Donations can not be designated for the benefit of a specific individual or family. Generally contributions to foreign organizations are not deductible. In order to claim charitable deductions, you must itemize your deductions on Schedule A of Form 1040. A new law allows you to claim donations for Haitian relief on your 2009 tax return, which you will be filing in 2010. The contributions must be made specifically for the relief of victims in areas affected by the Jan. 12 earthquake in Haiti. To be eligible for a deduction on your 2009 tax return, donations must be made between Jan. 11, 2010 and March 1, 2010. Only cash contributions will qualify to be deducted on your 2009 return under this new law. Contributions made by text message, check, credit card or debit card qualify. For donations by text message, a telephone bill will meet the record-keeping requirement if it shows the name of the organization receiving your donation, the date of the contribution, and the amount given. You have the option to take a deduction on either your 2009 or 2010 tax return, but not both. EconStories presents a rap explaining two theories of economics, Keynes’ and Hayek’s. Enjoy! Outright.com makes filing 1099s easy. This is great since the deadline to file 1099s and send to independent contractors is January 31, 2010. 1099-MISC reports quite a few things to the IRS, namely, “payments for services performed for a trade or business by people not treated as its employees,” so they are aware of a wide variety* of transactions which may or may not be taxable. Last fall, I heard about BrightScope at Finovate. Today I got a press about their Personal 401k Fee Report. This is great so you can evaluate the fees related to management of your 401(k).